Hanging basket at Lowes Garden Center Kahului, Maui, Hawaii (USA). January 03, 2008. Origin and Habitat: Namibia and South Africa (Lesotho, Namaqualand, Estern Cape, Free State, Limpopo, Gauteng, KwaZulu-Natal, Northern Cape, Western Cape). Altitude range: 20-1900 metres above sea level. Habitat: Senecio radicans is often encountered at the base of rocks where it inhabits a shallow, wind-blown soil. The dominant vegetation consists of xerophytic dwarf shrubs and succulents, including Sarcostemma viminale and Cynanchum tetrapterum, as well as Crassulas. These drought-tolerant plants are frequently spaced far apart with wide expanses of sandy or rocky stretches in between. 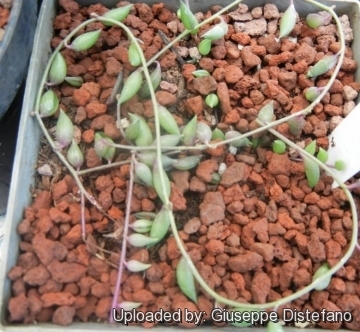 The succulent tissues of Senecio radicans help to conserve moisture, rendering it well-adapted for the dry, hot conditions characteristic of its native regions. 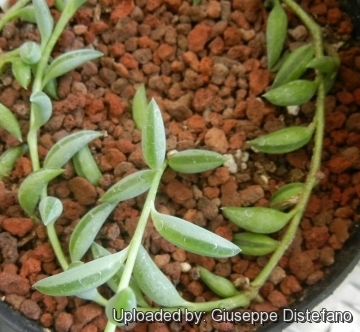 Description: Senecio radicans, widely known as String of Bananas or Fish Hooks senecio, is a popular hanging plant forming a waterfall of slender, flexible stems lined with curved banana blue-green leaves. 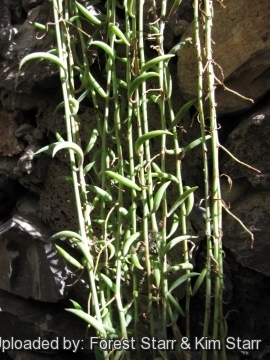 It is similar to the more common String of Pearls (Senecio rowleyanus), but the leaves are larger, much more elongate (shaped like a banana), glossy with an alternate arrangement and a delicate branching pattern of the strands. The stems are thicker and somewhat more erect. The evenly spaced leaves form a seemingly endless chain of green “banannas” as they creep along the soil. The white and mauve rayless heads of flowers are similar too. It is widespread and very variable but not readily divisible into subspecies. Habit: It is an evergreen, dwarf, trailing, succulent perennial forming large carpets and will be pendant or scandent with time. If grown in a rockery it will root down along the whole lengths of its stems. Stems: Prostrate glabrous green more or less glaucous, succulents. Branches slender, wiry, to 1 m long or more, 2 - 3 mm in diameter, usually wing-angled, rooting. Leaves: Scattered, erect, highly succulent, 7-26(-30) mm long, 4 -9 mm in diameter, from spindle-shaped to almost spherical but always slightly curved upward or banana-shaped with a conspicuous off-centre mucro on the tapered apex, and with a clear window along the adaxial surface plus 20 -50 clear striations, otherwise pale green. Inflorescence: 10 - 15 cm long, rarely branched. Flower heads (capitula): 1 to 4 cinnamon-scented, white or off-white, usually in the late winter or early spring seasons, although some growers are able to encourage multiple flowering periods throughout the year. Phyllaries 10 - 12; Ray florets none. Disk flowers 20 - 25, white, fragrant; Anthers yellow or mauve. Fruits (achenes): Ribbed with a pappus 13 -15 mm long. Chromosome number: 2n = 20, 40, 60. 7)Forest & Kim Starr “Senecio radicans (String of bananas)”. Plants of Hawaii. <http://www.starrenvironmental.com>. Web. 27 Sep. 2014. Cultivation and Propagation: Senecio radicans is grown for the shape, texture, and colour of its attractive foliage rather than for its blooms which are small, white, and not very showy. It is easy to grow, do well in succulent gardens or in a pots in a window sill and forms the striking trailing stems if grown in a suspended basket. A pot atop a pedestal or a hanging basket serves as a perfect home for this trouble-free succulent that tolerates full sun in all but the hottest climates. It is also a great plant for small apartments and is available at many garden centers, specialty stores, and other places where plants are sold, but it is also sold through the internet. S. radicans can provide a much needed textural element to a garden. In a warm Mediterranean climate, it can be grown as a ground cover as well, and if grown in a rockery will root down along the whole lengths of its stems. 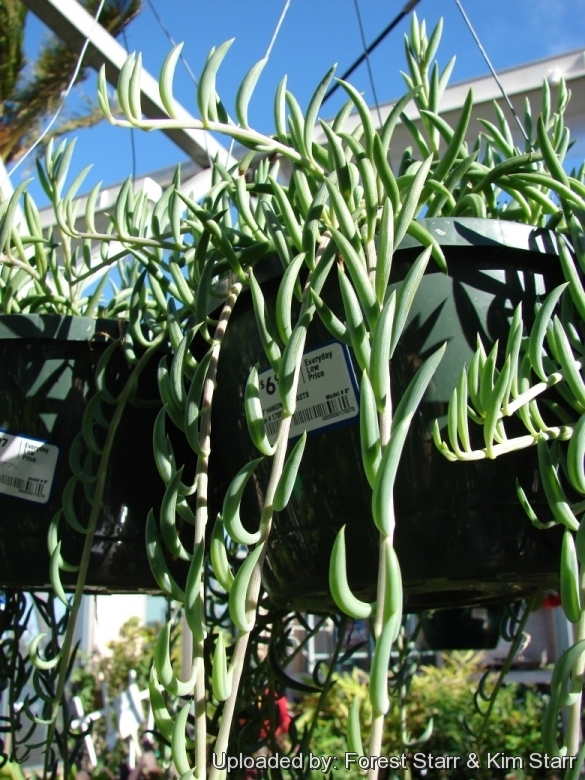 It is more drought-tolerant than Senecio rowleyanus, but it needs higher light and is far more prone to etiolation. Growth rate: The plants grow profusely and can fill a 25 cm pot in just a year or two given the best conditions. Soil: This plant does well in a cactus potting mix. Use pot with good drainage. Watering: Water regularly during the growing season every weeks or so, making sure to drench and letting all the water drain out of the pot. If all the leaves fall off don't fret, stop watering and wait until it starts to grow again. Less water during winter months. In the rest period no high atmospheric humidity!! Care must be taken with watering as they tends to become swollen and untidy in growth habit if given too much water and shade. Exposure: Grow it in slight dappled shade including two to three hours a day of direct sunlight through the year, which encourages flowering and heavy leaf production. Outside in the summer, it grows normally and the leaves attain a lovely blue-violet hue. So, recommended as a houseplant with the caveat that it needs a good deal of light if you want to see the normal leaf shape and any flowers. It do not do well in full shade as it tends to etiolate, and rots easily. 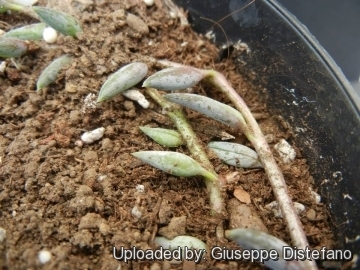 Hardiness: Like most succulents, this species is frost-tender and cannot withstand freezing temperatures, restricting it to areas where the annual temperatures do not drop below this point, but less so if kept on the dry side prior to, and during, cold weather (hardy to -5° C for short periods). However some warmth throughout the year will increase the grower's success (minimum 5° to 8°C during rest season). It does not like hot weather and needs cool air with ample airflow. Pest & diseases: Just be sure to treat for aphids and mealy bugs if they appear. Rot it is only a minor problem with succulents if the plants are watered and “aired” correctly. If they are not, fungicides won't help all that much. Warning: Senecio radicans is purely ornamental and should never be ingested since all portions of this species are toxic. Propagation: Stem cuttings are easy to propagate, cut off strings near a node and stick them into fresh soil to restart. The cuttings should root in 2 to 6 weeks. It will form potato-like lumps under the soil.